Matt Marton - For Shaw Media Richmond-Burton's Alex Perez (20) breaks up a pass against UP/Bronzeville's Howard Brookins (24) in a Class 4A first-round game. 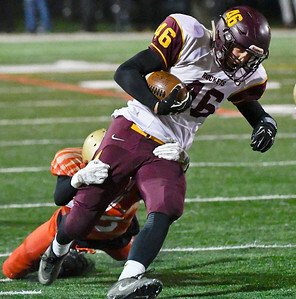 Saturday , Oct. 28, 2017, in Chicago, Ill.
Matt Marton - For Shaw Media Richmond-Burton's Michael Kaufman (46) runs against UP/Bronzeville's Javon Ewing (15) in a Class 4A first-round game. 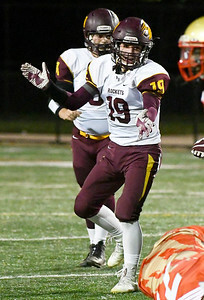 Saturday , Oct. 28, 2017, in Chicago, Ill.
Matt Marton - For Shaw Media Richmond-Burton's Dalton Wood (19) claps after he stops UP/Bronzeville's Chrisone Marone (2) in a Class 4A first-round game. 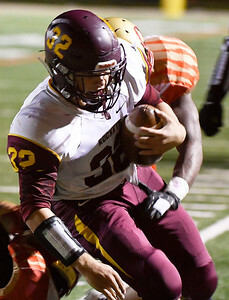 Saturday , Oct. 28, 2017, in Chicago, Ill.
Matt Marton - For Shaw Media Richmond-Burton's Dalton Wood (19) stops UP/Bronzeville's Chrisone Marone (2) in a Class 4A first-round game. Saturday , Oct. 28, 2017, in Chicago, Ill.
Matt Marton - For Shaw Media UP/Bronzeville's Johnny Collins, left, and Javon Ewing (15) stop Richmond-Burton's James Horner (32) in a Class 4A first-round game. 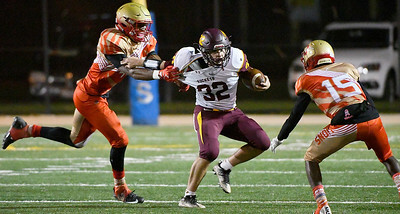 Saturday , Oct. 28, 2017, in Chicago, Ill.
Matt Marton - For Shaw Media Richmond-Burton's James Horner (32) runs against UP/Bronzeville in a Class 4A first-round game. 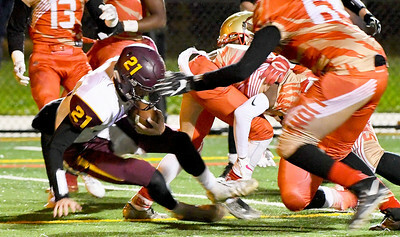 Saturday , Oct. 28, 2017, in Chicago, Ill.
Matt Marton - For Shaw Media Richmond-Burton's Shane Byrne (21) runs for a touchdown against UP/Bronzeville in a Class 4A first-round game. 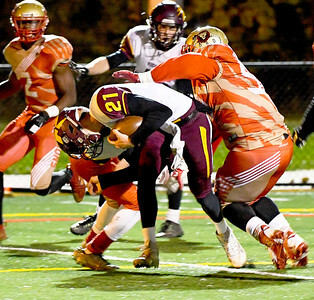 Saturday , Oct. 28, 2017, in Chicago, Ill.
Matt Marton - For Shaw Media Richmond-Burton's Shane Byrne (21) runs for a touchdown against UP/Bronzeville's Marquise Martin (50) in a Class 4A first-round game. Saturday , Oct. 28, 2017, in Chicago, Ill.
Matt Marton - For Shaw Media UP/Bronzeville's Johnny Collins (43) , tackles Richmond-Burton's James Horner (32) in a Class 4A first-round game. Saturday , Oct. 28, 2017, in Chicago, Ill.